Plant lovers in Greater Providence and beyond mark the start of the growing season each year by the return of SCLT’s Rare & Unusual Plant Sale. The event takes place at City Farm the weekend of May 18-19, 2019. This year’s will be our 27th! If you haven’t been, City Farm is a lush oasis at the corner of West Clifford and Dudley Streets on Providence’s South Side. 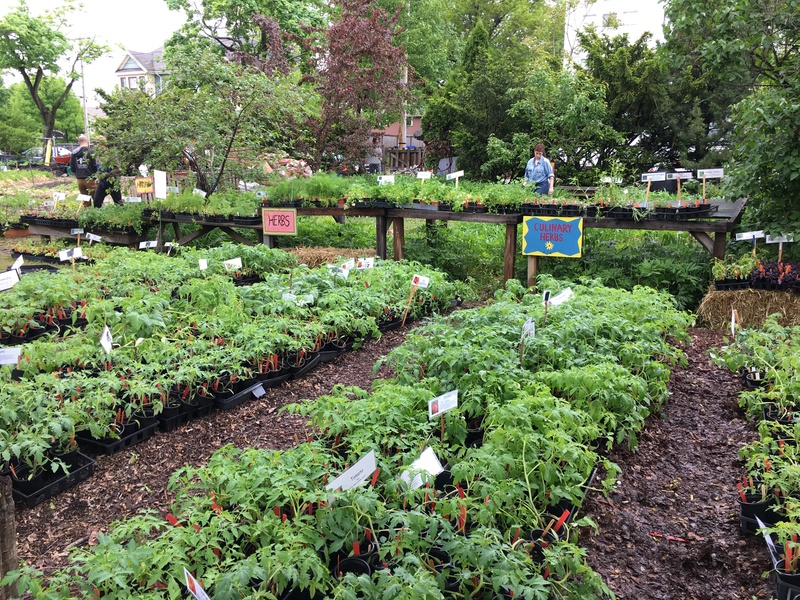 The Sale features hundreds of varieties of sustainably grown annuals, perennials, and fruit and vegetable plant starts – roughly 20,000 in all. Flats are arranged on tables along pathways that meander among the vegetable beds, chicken coop and compost operations on our working farm. Local performers entertain shoppers with live music. Experienced gardeners are also on hand during the event to answer your gardening questions. City Farm uses only organic seeds from high-quality, trusted sources, which are sown inside our green house over several weeks each spring. Many of the plants are hard to find (if not impossible) at local nurseries. The Sale attracts roughly 2,000 gardeners who look forward to this bucolic spring tradition. Proceeds from the event support SCLT’s education and community outreach programs. SNAP, EBT and senior nutrition coupons are all accepted, and SNAP customers receive an additional 40% on all purchases. The Sale begins with a preview from 9-10 am on Saturday for SCLT members, who may also pick up 50 gallons of free, organic compost during the Sale.